Stamp production has always been of interest to our readers. The Specialist has taken a continuing interest in the production of classic as well as modern issues, while leaving classic postal history to other journals which amply cover that broad area. 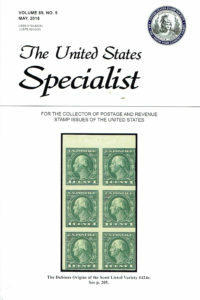 Philatelic literature is another area of special interest and coverage. ‘The Specialist attempts to cover new books and publications with the best written and illustrated reviews published any where. Each month The Specialist also Contains news of the hobby and short features of interest on general Collecting topics. These may include collecting approaches, new materials, design information, postage rates and usage, freaks and errors and material seen by the editors which may he of special note to catalogue compilers. Each issue of The Specialist remains a useful reference work for years to come. The Specialist is available as a bound volume at the end of every year. Both monthly issues and bound volumes of past years have been in strong demand in the philatelic literature market. The United States Specialist, has been devoted to all aspects of U.S. philately. Since 1930, The Specialist has been especially strong in reporting on printing technology, plate varieties, plate layouts, marginal markings and plate numbering. Many important discoveries in U.S. collecting have been published in its pages which have resulted in new and variety listings in the Scott Specialized Catalogue of U.S. Stamps and Covers. The Specialist contains news of the hobby and short features of interest on general collecting topics. These may include collecting approaches, new materials, design information, postage rates and usage, freaks and errors. Every issue of The Specialist remains a useful reference work for years to come. The Specialist is also available as a bound volume at the end of every year. Both monthly issues and bound volumes of past years have been in strong demand in the philatelic literature market. Many USSS members are very active national and international exhibitors covering all areas of United States philately. They are constantly searching for quality material needed to improve existing exhibits or to become part of a new creation. Many also will dispose of significant holdings when they feel they have conquered one area and decide to move on to a new one. 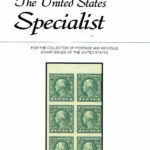 A well crafted ad run regularly in The United States Specialist will put your name in front of these philatelists month after month and will surely add to your bottom line, both now and in the future. To tap into this market, contact our editor Martin Miller (864) 322-6847 | email:TheSpecialist@theimageforge.com or via our website, www.usstamps.org . He will help you create an effective ad at a very affordable cost.